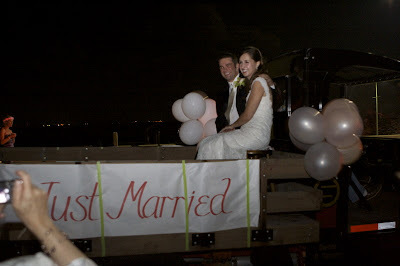 We just got back from being in Corpus Christi,TX for my brother's wedding. We had SOOOO much fun. It was just a great wedding. I want to share a few of the hundreds of pictures we took so settle back - this is a long post. We flew out very early Friday morning and arrived in CC around 9:30. We got checked into our hotel and it was time for me and my mom, aunts and cousin to go to the bridal lunch while Scott and my dad and my brother and uncle picked up their tuxes and ate lunch. 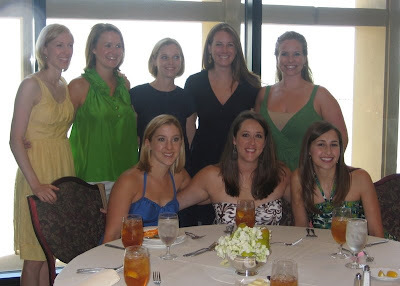 We had the rehearsal dinner at the Yacht Club. After the bridal lunch - my mom, Aunt Linda and I raced over to decorate tables. We worked most of Friday afternoon and got back to the hotel with barely enough time to get ready for the rehearsal. The rehearsal dinner was SO much fun. We had a mexican buffet that was so good and everyone gave wonderful toasts to Chris and Carrie. Chris' friends gave some hilarious speeches that had everyone rolling. My dad gave a wonderful speech that made everyone cry and then Chris spoke and cried and cried (my family is VERY emotional family) and it was so sweet. I heard several of Carrie's friends telling him they wanted him to give them a speech next. ha! Saturday - we slept in and then went and ate lunch with my family. Scott and I hit the beach by our hotel for a little bit but it was not the beautiful beaches like they have in Gulf Shores or Destin or Hawaii. It was kind of dirty and very crowded and hot so we didn't stay long. It was picture fiesta before, during and after the wedding. Here are Scott and I. The reception was held in another part of the art museum and it was set up so pretty in her colors of green and brown. They had a GREAT band and it was just so much fun. This was their surprise get away car her dad set up for them. It's an old, old truck and they rode in the back to their hotel. It was so cute. Chris and Carrie are just perfect for each other and they both looked SO happy on their wedding day. I'm so glad they are finally married and their wedding was just so much fun! Hope you all had good weekends too! First of all, you look so beautiful in all the pictures. I love that black dress!!! Carrie's dress is gorgeous and they do look so happy. 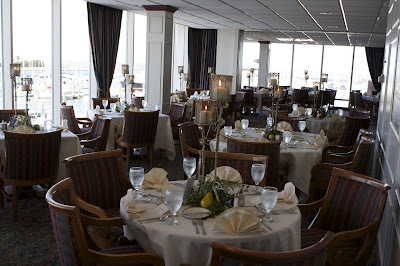 You guys did a great job on the tables at the yacht club...so pretty! I'm so glad you had a great weekend with your family and seeing your little bro get married. Looks like a really fun time! Where were all those cute dresses when I was looking for something to wear to a wedding?! 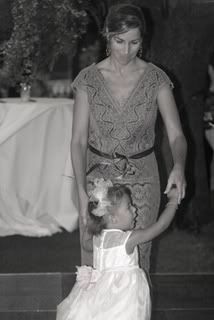 Kelly, I know you and your family had a ball at the wedding! It was so beautiful! Carrie looks gorgeous! They both look soo very happy! Glad ya'll had such a great time! the wedding and everything about it looked absolutely wonderful. what a great family event! Everything looked beautiful!!! I loved all the pictures--you did a great job documenting the weekend! Beautiful - everyone and everything. It sounds like a wonderful wedding to start off a marriage. Glad you had a nice weekend! Just beautiful!! Her dress ~~ WOW!! What a great job ya'll did on the tables at the Yacht Club!! So glad everything went so well. I love beautiful weddings and this one looked perfect! I love the colors they used and she looks gorgeous! I also love your dresses...you look very pretty! LOVE it all!! Can't go wrong with green in a wedding! :) You looked so pretty...as always! I LOVE weddings!! Her dress was gorgeous! It looks like you had a great time. You looked so pretty during all the events. Beautiful pictures. 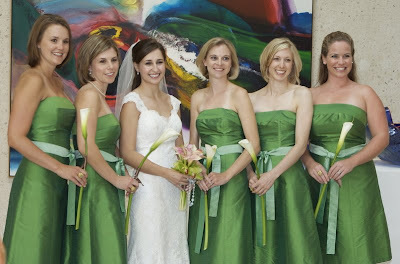 I love the bride's dress and the green bridesmaid dresses, too. Where are they going on their honeymoon? Whew...I am so glad that you were at the wedding and not holed up at home sick. :) I forgot that this weekend was the BIG weekend! The pix are absolutely adorable and I loved all her wedding stuff. Blessings over the new couple! What a beautiful family you have. The bride & groom are so pretty together (cute little bro!). Happy for all of you! Kelly, even pregnant you still have the perfect little figure! : ) You looked great! Everything looked so classy and elegant!!! The holidays are going to be SO MUCH fun with a new sister-in-law!! I have been looking forward to this post ;)! What an absolutel BEAUTIFUL wedding! You look so radiant (the mother glow) in your picture!!! And you won't believe this but I know one of the girls in Carrie's house party. I led her Bible study group when she was in high school and now she's dating one of our friends. What a small world! What a gorgeous wedding! I love that green. They are a beautiful couple. Love all your cute dresses-you look so great. Your dress is so cute, Kelly! I love the green and brown! It was beautiful! So was the bride and her dress! They are a really cute couple! You can always find the cutest dresses. Great pictures of a beautiful wedding. They look perfect together. Many blessings to your growing family. How fun! That's cool they were married in an art museum! And I love your black dress for the wedding day...perfect!!! It looks like you guys had a ball. I love the green and brown. You looked wonderful. What a beautiful wedding!! I know that was such a happy and special time for your family! Your brother and his wife are such a cute couple. And you looked so pretty in your black dress! It looks like that art museum was amazing, too. The view out onto the water was breathtaking! I wish them a long and happy life together! Wow! Too many gorgeous things to mention...love her dress and the bridesmaids dresses. Everything was so pretty! What a beautiful couple and I love the new family shot! Glad it was such a wonderful weekend for you and your family! What a gorgeous wedding!! I love the colors...especially the bridesmaids dresses!!! You look great! Are you feeling any better? VERY PRETTY! I loved all your dresses. This wedding looks like a lot of fun. Beautiful wedding! Were your dresses cool enough for the heat? Everyone looked so nice. I love your mom's outfit too. What is the house party? Obviously different from the wedding party! What a gorgeous couple and wedding! You look great too! I love that black dress! Please forgive your Texas readers for not warning you about our beaches. They are generally not a blessing unless you're desperate. The wedding pictures are gorgeous! What a beautiful family y'all have! I loved seeing all the pics. You look so cute--I love all your empire waist dresses. Sorry you had to experience TX beaches. Everyone always asks why we leave our state to go to the beach when we have one...now you know!!! Kelly, I loved all the dresses that you picked out for the weekend! You looked so pretty and definitely had the pregnancy glow everyone always talks about! 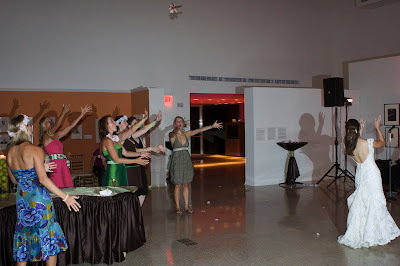 :) The wedding was beautiful and I loved the idea of having it in an Art Museum! Very fun weekend..where did they honeymoon? I love to hear about the fabulous places couples chose!! You, your mom, & everyone looked super cute. Are you feeling better? I usually can't say that I'm a fan of orange (this is Auburn, Tennessee and Florida's fault) but I am loving you in that orange dress. Oh and the black dress you chose for the wedding was perfect! Also that cake was so beautiful... 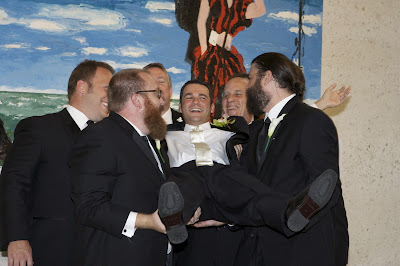 I just love awesome weddings like that...and I'm sure they're never going to forget it! Looks like you had a great time :) Was your family also so excited for you??? I love the colors of the green and brown..........I see the pears. Your new sis-in-law must like pears. I think it looks great. BTW, what is a house party?? Your taste in dresses is always perfect! You look great too by the way! 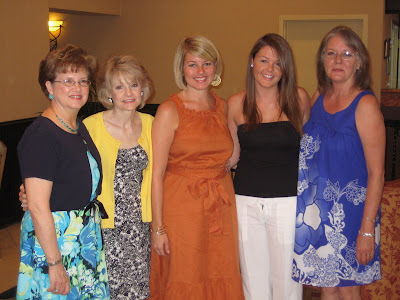 I love weddings -- especially when it's family! Looks like the wedding was a beautiful event! You look absolutely beautiful in all of your pictures! You are so photogenic! I love all of the dresses that you wore. I know your family has been looking forward to this weekend for a long time and it looks like it could not have been more perfect. I love the picture of your new family. 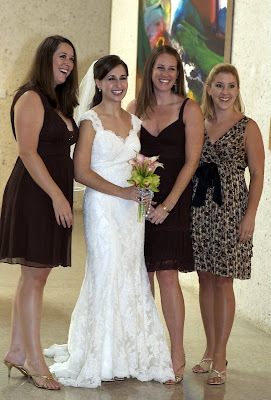 Carrie was a beautiful bride and she is truly blessed to be part of such a wonderful family! That looks like THE most fun wedding! 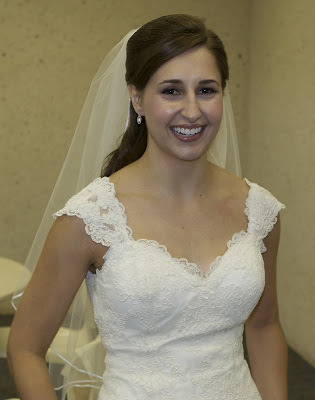 I always thought Carrie was cute, just adorable... but she was a gorgeous bride! 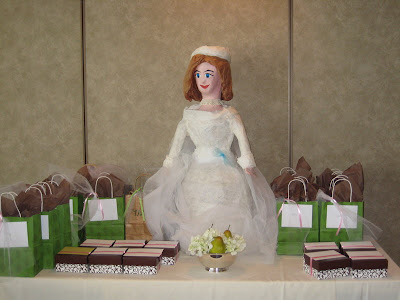 Ok, I like the paper mache bride the most! How cute! what a beautiful wedding and a beautiful family! Glad you had a good time and you look great! All I have to say is hot mama! I agree with everyone else, you look fabulous in all the pictures. And, I love the black dress!! 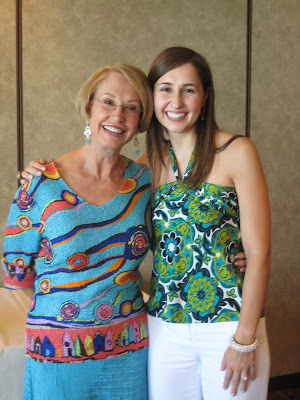 I'm happy everything went smoothly on your flight so you didn't miss the bridal luncheon. It looks like it was a beautiful wedding!! Yes, the Corpus Christi beach is not-so-great! That's why all we Texans head east in the summer! All your dresses were so cute! 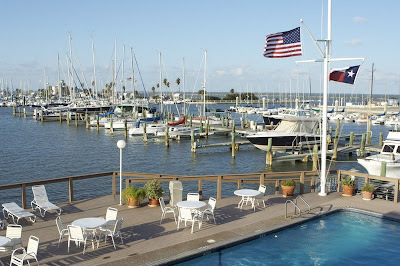 Loving the yacht club setting and decor. 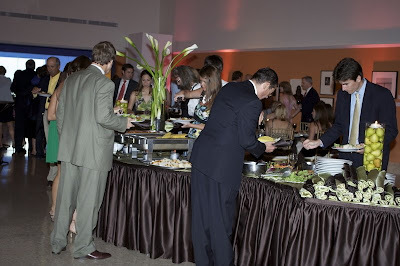 The art museum is such a great venue, too! I love your dresses as well. I found your blog through MMM's blog. Love your dress choices - may I ask where you found them? You look gorgeous! Everone looks so pretty...especially the bride! I love her dress! Congrats to them!! Kelly, your blog is so fun. I only took a look at it tonight. Chris and Carrie are truly "a perfect pair" to go with their pear theme and the colors of their wedding were so fun, timely. Your mom always managed to show up in the perfect ensemble, complete with coordinated accessories. Love your family. I have known Carrie since she was about the size of an apple in her mother Chris' belly. Thanks for coming to Corpus Christi to celebrate with all of us locals.